Yes, that’s poppies and not puppies. Surprising, no? 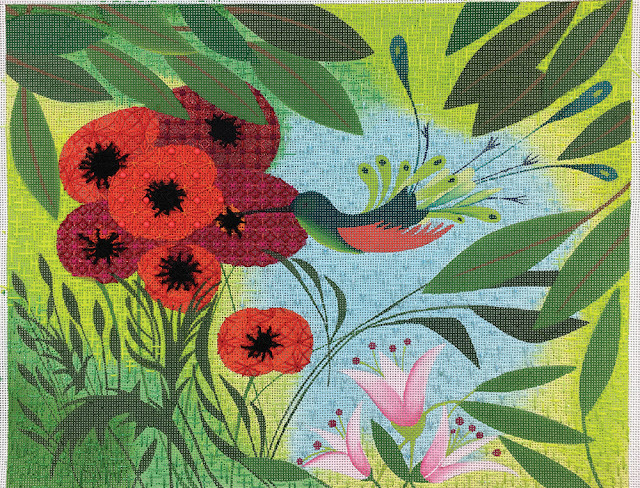 Today we stitched the poppies on the Zecca hummingbird canvas! So many fun details. Or maybe not so many details. Depends upon your view of things. There are orange and red poppies. Both are stitched with composite stitches that are sort of floral. 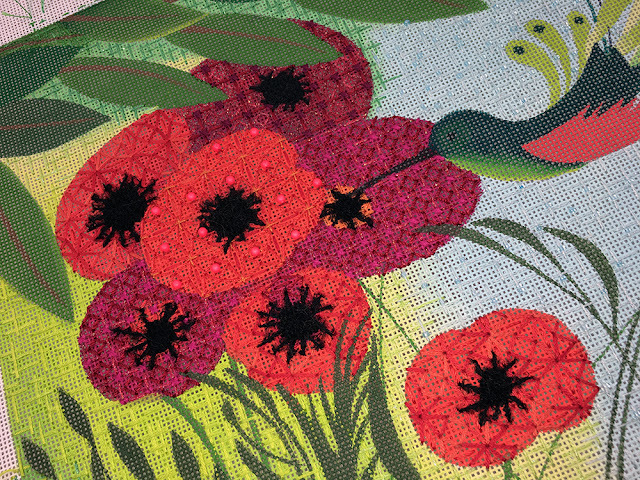 One stitch for the red poppies and one stitch for the orange poppies. Now here’s where it gets interesting. The threads are rearranged withing the pattern to make the poppies look different. Keeping the patterns the same but slightly manipulating the threads keeps the piece from getting busy and creates depth. Yes, my mind works in mysterious ways. Lesson 3 is in 2 weeks. It will be here before you know it. We have a few canvases in stock if you’ve been thinking of joining us, now is the time. Give us a call at 410.296.0405 or order online. My favorite! Love how round the poppies look too! I am still waiting for the Why Fit In lesson. It is disturbing that I see all these new projects and nothing on this class. This looks really cool, Ruth. I thought you would do big ribbons – love the textured look of this! Can't wait to see where you take this. Ruth, your stitch ideas are so beautiful and creative!! I would love to participate with this piece or, especially, the new Owl and a Key piece, BUT, I can't invest in any more projects until Why Fit In is completed! It started in January 2014 and you've only completed four lessons, the last one arriving 15 months ago! It will take at least another two lessons to complete. It is really frustrating to see how many pieces and classes you continue to add while this one is just hanging out there. I could finish it with my own ideas or the input from some other teachers, but I took it to see your ideas and interpretation. You don't have to finish the areas yourself. Partial stitching is fine. Just please put some time and attention to getting this one finished with the same degree of creativity and fun that I know you have envisioned for it. It would free all of us from this holding pattern and surely get the monkey off your back. Why Fit In will be coming very soon. It's almost ready to fly the coop. I am sorry for the delay. I'm trying to keep a lot of balls in the air. I seem to think I can do more than I can. Good news is that I have some helpers for a little while and have been focusing on the beautiful bird. I hope you will love her when you see the next lesson. With that one I hope to be back on track!